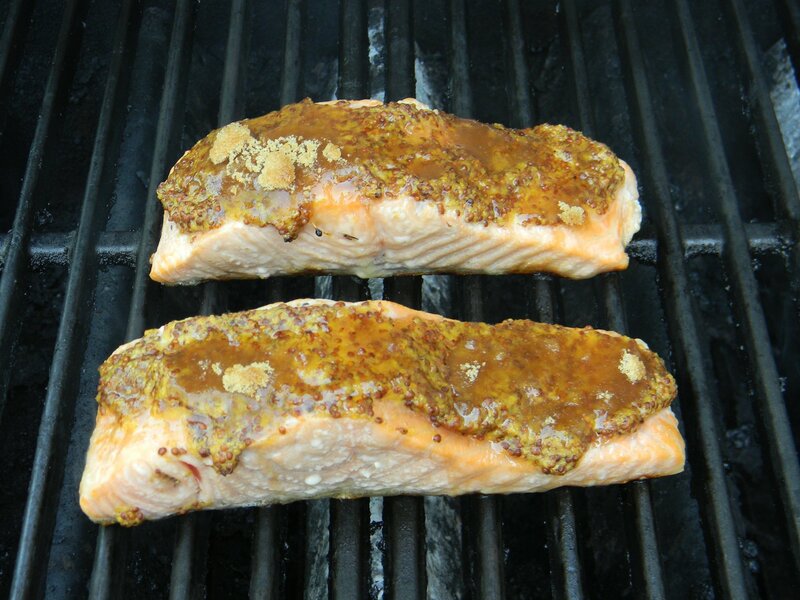 Grilled Salmon with Brown Sugar and Mustard Glaze….. This recipe for salmon couldn’t be more simple. 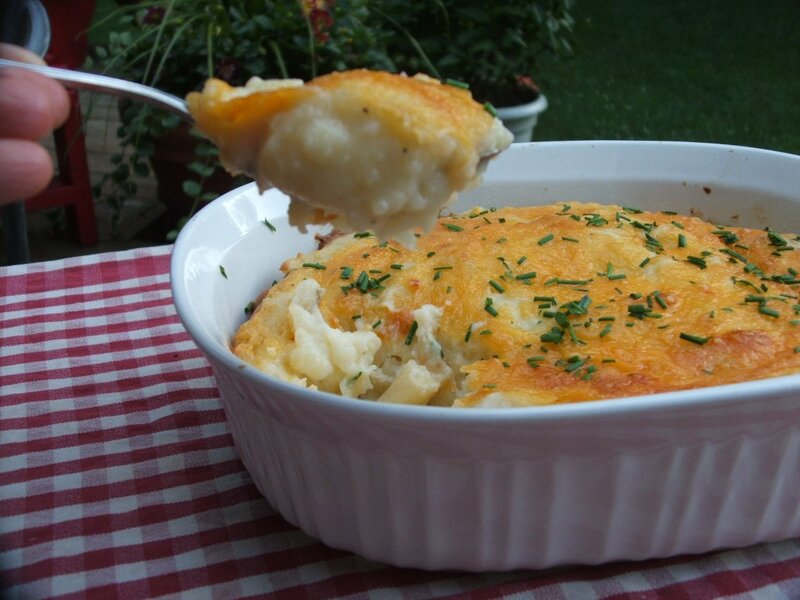 My friend Mickey shared her recipe years ago and it’s been a favorite of mine ever since. Amazingly, there are only three ingredients. 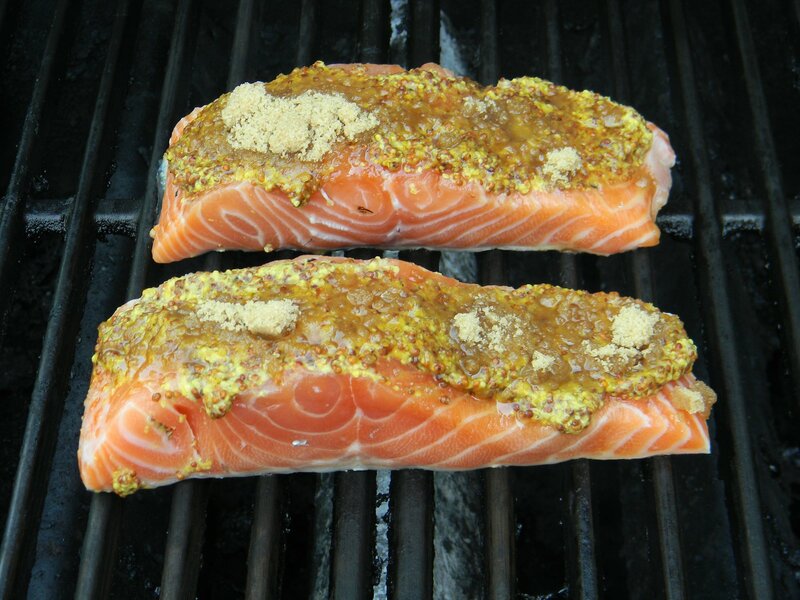 Salmon, whole grain mustard and brown sugar. That’s it. It is best prepared on the grill. 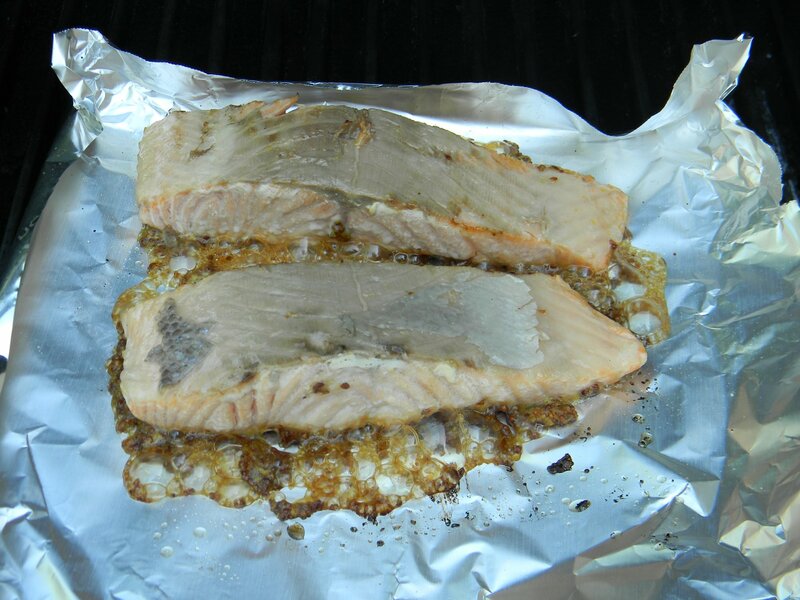 You’ll want to flip the salmon onto a piece of non stick foil to finish the cooking otherwise you will lose all the goodies in the grill. Start by rinsing the salmon and patting dry with a paper towel. Place on a plate for grill transport. Spread 2 tablespoons of mustard evenly over each piece of salmon. 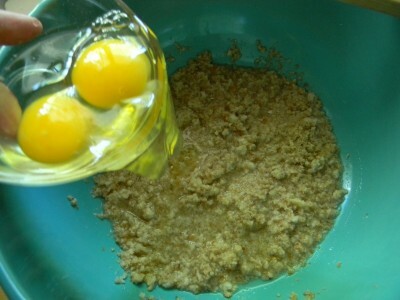 Add the brown sugar, patting it into the mustard. Gently place the salmon fillets on the grill, skin side down. Close the lid and let them cook for about 8 minutes. The fillets should now look opaque. Gently slide your spatula between the flesh of the salmon and the skin and flip onto the non stick foil. You can see that I’ve turned the edges of the foil up to keep the topping from dripping into the grill. Close the lid and cook for 5-7 minutes. Discard the skin. The salmon is done and you can see that the mustard and brown sugar have caramelized. 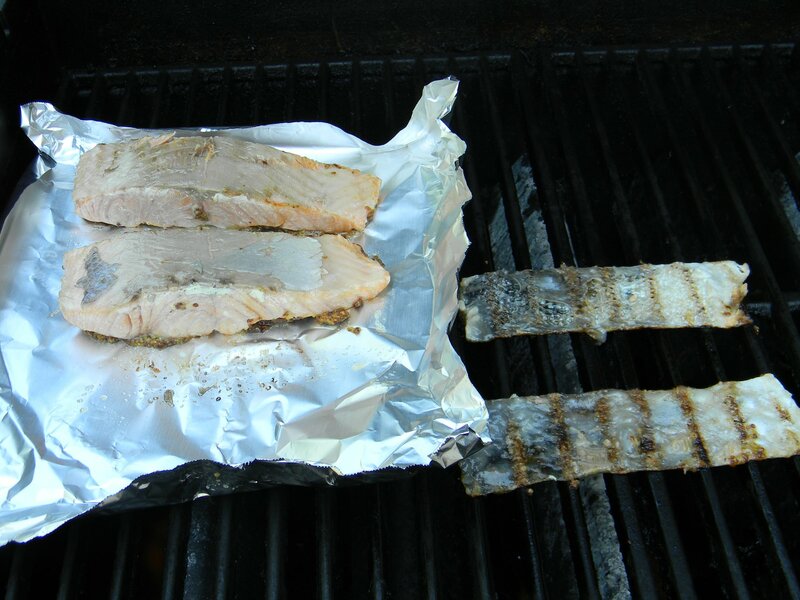 Carefully remove the fish/foil from the grill. It is easy to slide onto a flat cookie sheet. 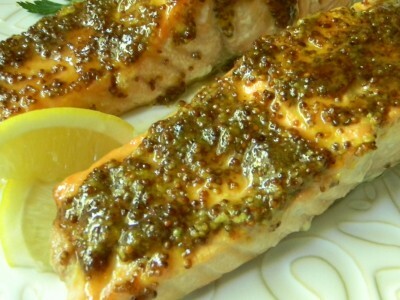 Turn the salmon over onto a clean serving plate and spoon the mustard/sugar mixture over the salmon. 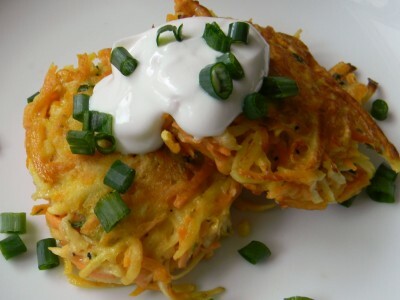 Serve with sweet potato and parsnip latkes and oven roasted asparagus. Elegant and delicious! 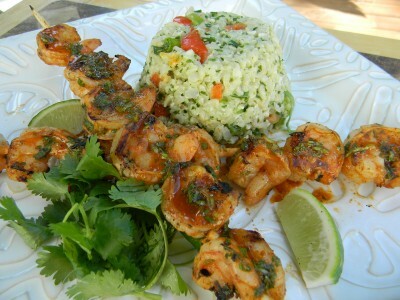 Chili Lime Shrimp with Lime Cilantro Brown Rice Salad….. In case you haven’t yet noticed, I am in love with lime and cilantro. 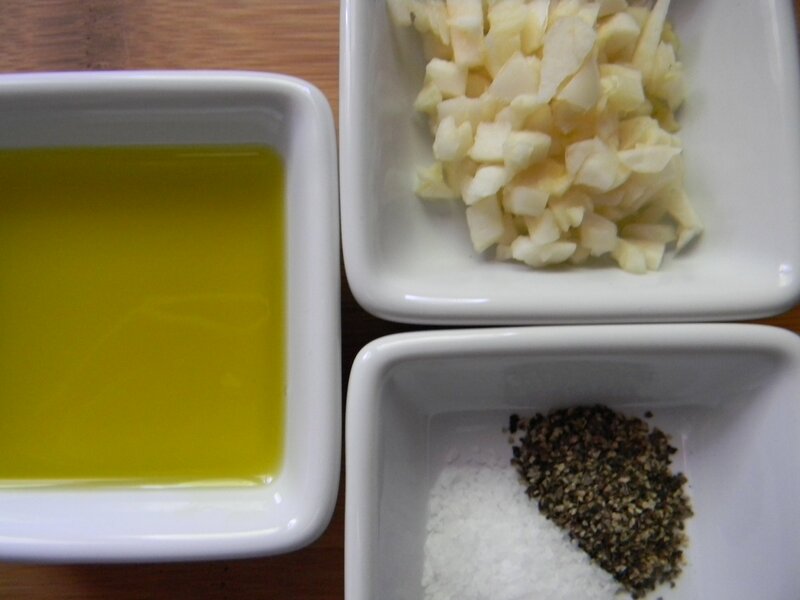 This combination is fresh and makes most any grilled fish, chicken, or salad absolutely delicious! I made this combination for the first time over Labor Day weekend and it got rave reviews. For starters, marinated and grilled fish takes minutes. Really. I then save a bit of the delicious marinade to spoon over the cooked fish and a little over the salad…DELISH! This brown rice salad is a wonderful accompaniment to the Grilled Chili Lime Shrimp. The brown rice lends the perfect texture, the green onion and red bell pepper a little crunch, and the crumbled cheese a little salt and cream. It’s perfect. 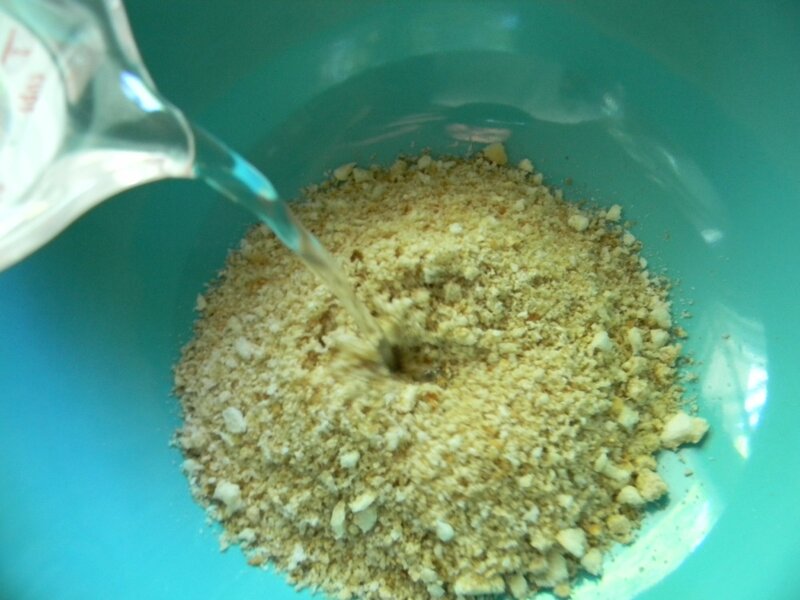 Why not make a whole bag (about 5 cups uncooked) of brown rice and freeze it for later use? 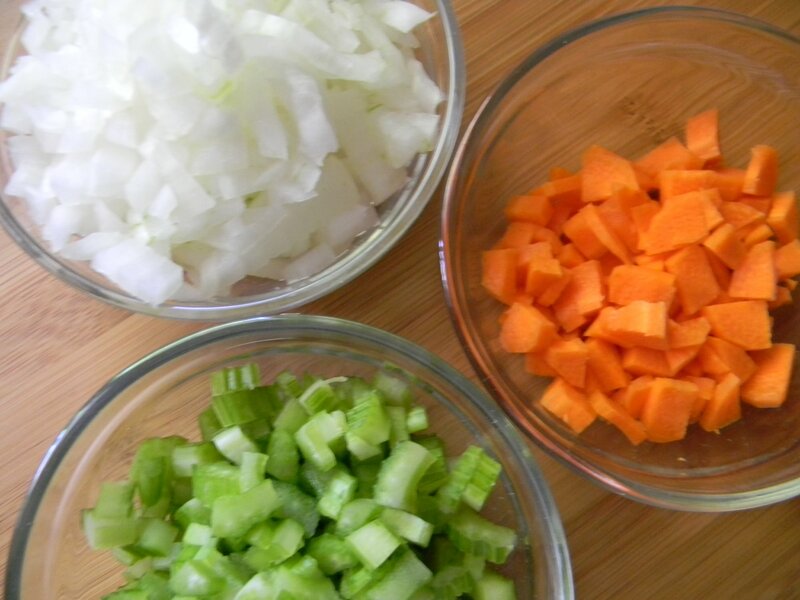 Defrost and use in this salad or any other quick weeknight dinner. It’s best to use completely cooled rice for the salad. 1) Combine all of the marinade ingredients, whisk well to combine. 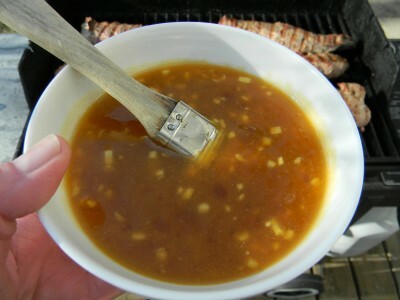 Reserve a couple of tablespoons of the marinade to spoon over the cooked shrimp. Use the rest of the marinade for the raw shrimp. Marinade for 20 minutes before grilling. Skewer the shrimp and cook over medium high heat for 4-5 minutes. Shrimp will be bright pink when they’re done. Spoon the reserved marinade over the shrimp when ready to serve. Makes 4 servings. 1) Whisk dressing ingredients together in a large mixing bowl. 2) Add the salad ingrediens to the dressing bowl. Mix well to combine. Taste and add more salt and pepper if necessary. Makes four 1/2 cup servings. *Fresco Mexican Cheese is made from cow’s milk. It tastes a bit like mozzarella yet has a crumbly almost grainy consistency. It doesn’t melt completely like mozzarella. **If you’d like a more spicy shrimp, add a couple of pinches (or more) of cayenne to the marinade. ***If you’re using bamboo skewers, soak them in water for 20 minutes before using to prevent burning on the grill. 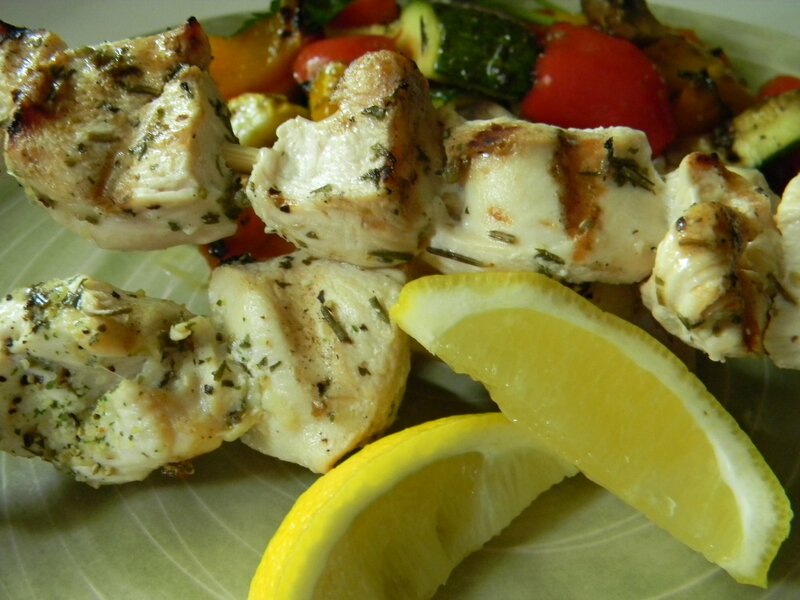 Grilled Lemon and Herb Marinated Kabobs…..
Often times you’ll see kabobs with meat/chicken, onion, and tomatoes, etc. I’ve never cooked kabobs this way as none of these items have the same cooking time. By the time the meat is done, the tomatoes are falling off the skewer and into the fire and the onions are undercooked. Cook each individual item on it’s own skewer. I recommend cooking onions and mushrooms on metal skewers as bamboo even after soaking can char and break apart. If you are using bamboo skewers be sure to soak them in water for 45-60 minutes. 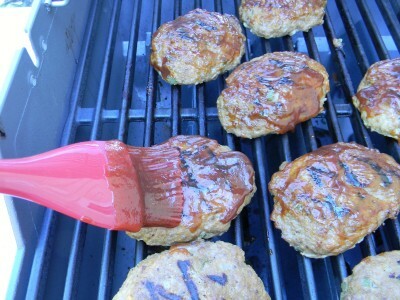 This will prevent them from burning up too quickly on the grill. This is one of my favorite ways to enjoy boneless, skinless chicken breast. 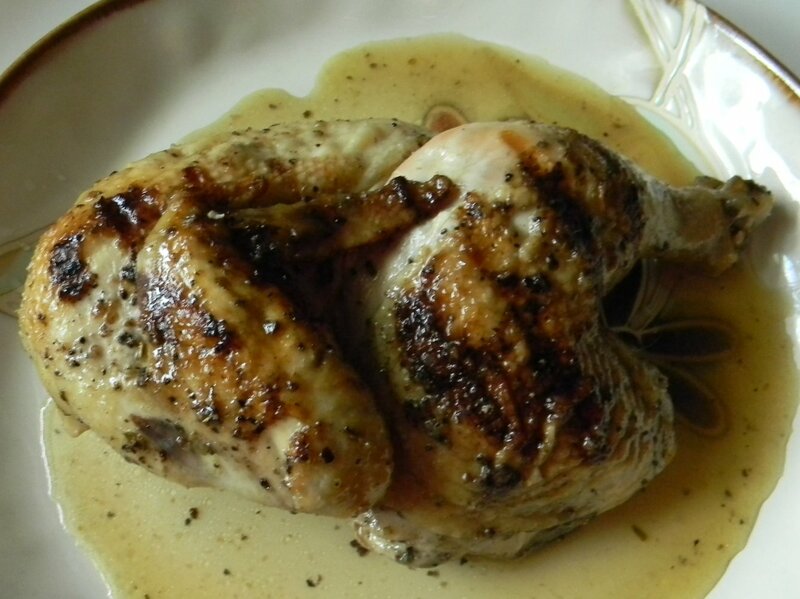 I’ve actually become very fond of boneless skinless thighs as a less expensive and extremely flavorful alternative. Marinade the chicken in this simple marinade for about an hour, skewer, and grill. They cook in 12-15 minutes. Serve with simple rice pilaf or oven roasted dijon potatoes and a grilled vegetable salad (recipe below). 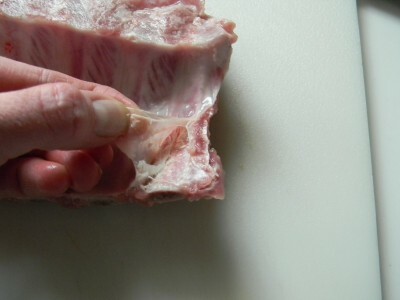 1) Trim the chicken pieces of any fat and cut into bite size pieces. Put into a medium size bowl that has a lid. 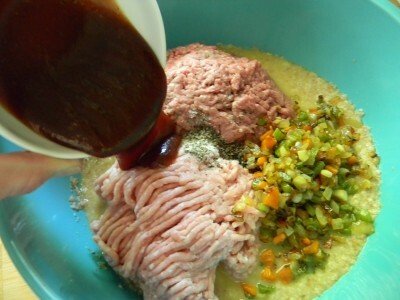 2) Mix all marinade ingredients together and whisk to blend. 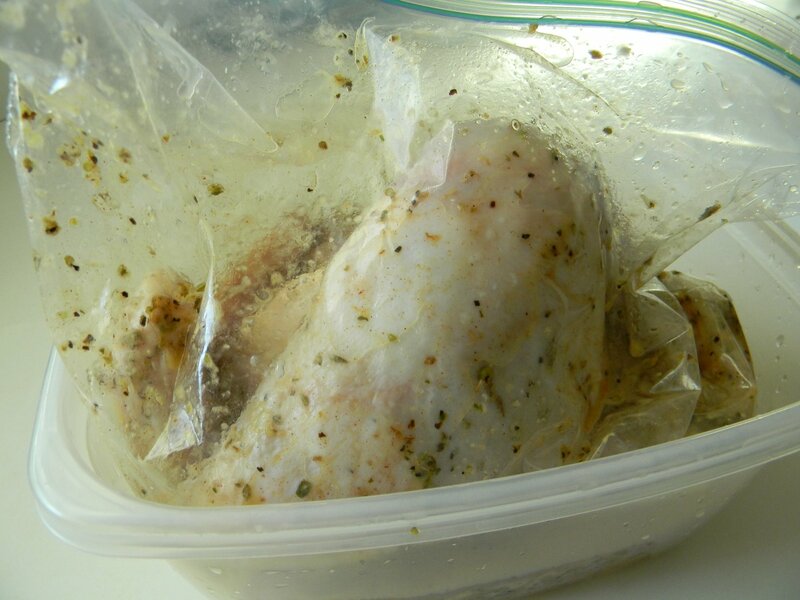 Pour half of the marinade over the chicken, cover and refrigerate for about an hour. Refrigerate the remaining marinade as well. If you’re using bamboo skewers, soak in water until you’re ready to skewer chicken. 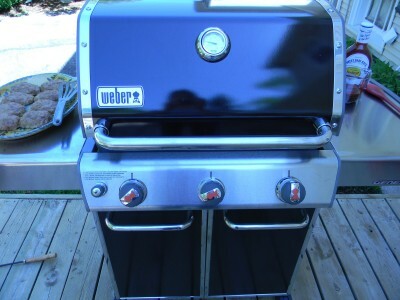 3) Preheat grill. Remove chicken from the refrigerator and skewer. 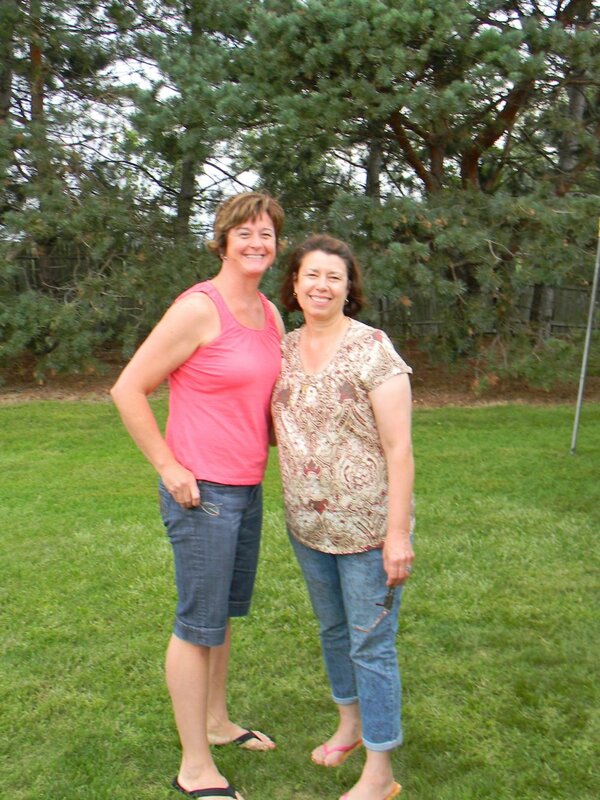 Place the kabobs on the grill. Resist turning them too soon, you want nice grill marks on the chicken before you turn. Cook for 12-15 minutes or until juices run clear. 4) Place the kabobs on a platter and cover with foil. Microwave the remaining refrigerated marinade for 20-30 seconds to take off the chill. Spoon over the chicken before serving. Makes 8-10 kabobs. 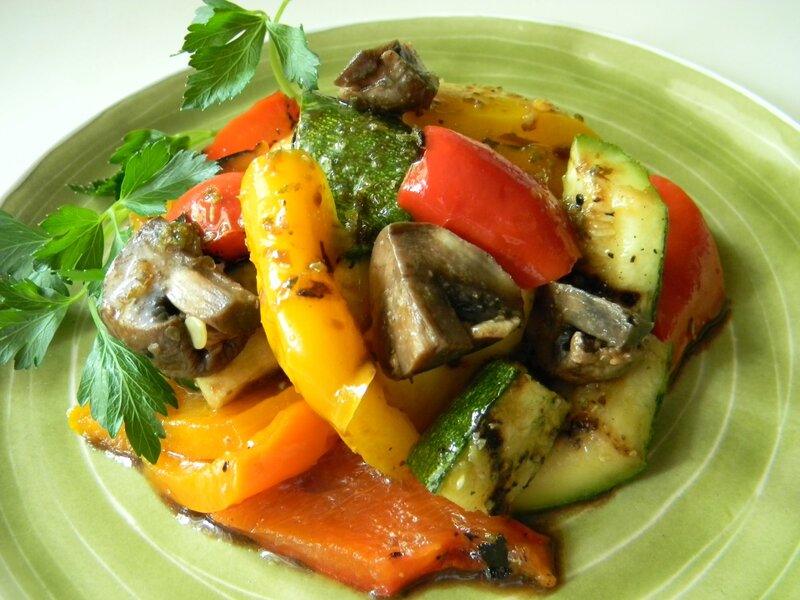 Grilled Vegetable Salad with Balsamic Vinaigrette….. This is an absolutely beautiful salad made with readily available fresh summer produce. Simply season with olive oil, salt, and pepper. 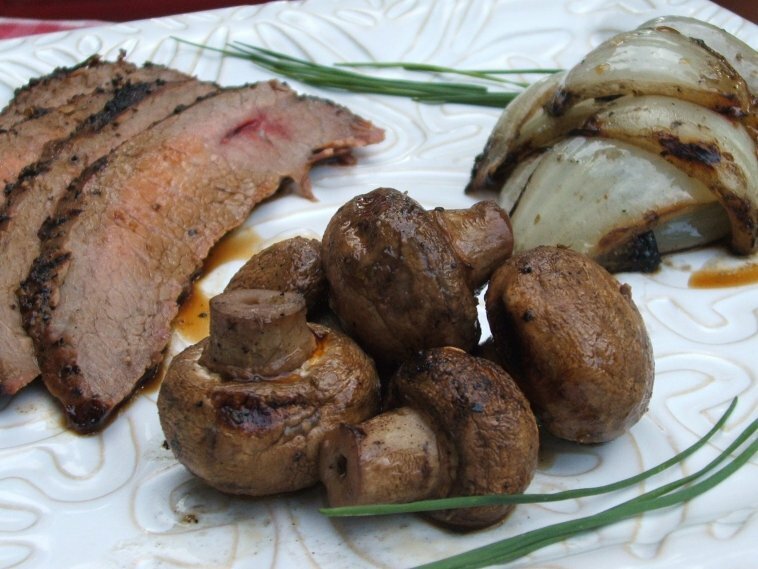 Grill and add a drizzle of balsamic vinaigrette. 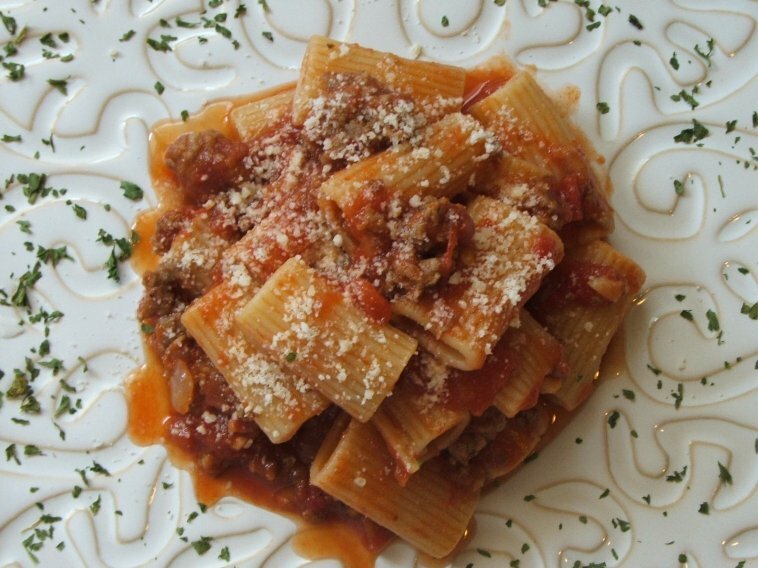 Serve with anything from grilled Italian sausage to a simple cheese and garlic pasta. 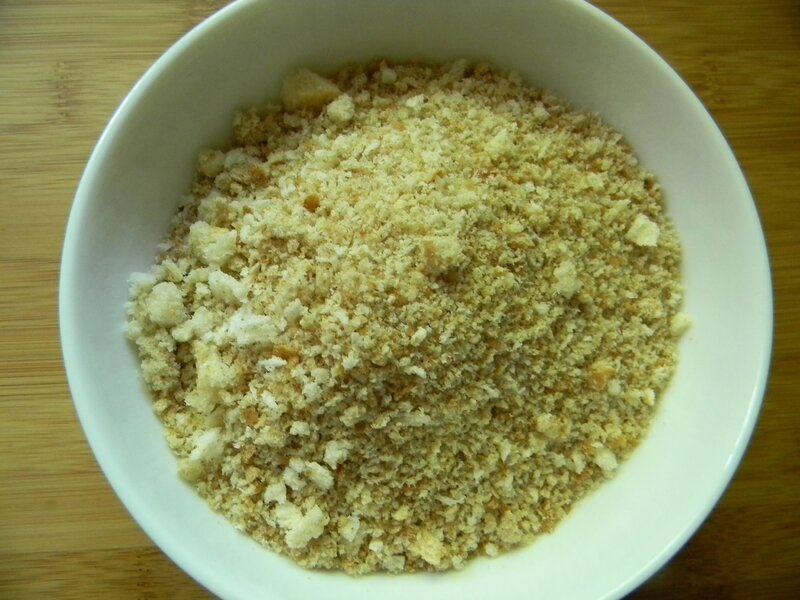 You could top with some fresh shaved pecorino romano cheese or bleu cheese crumbles. 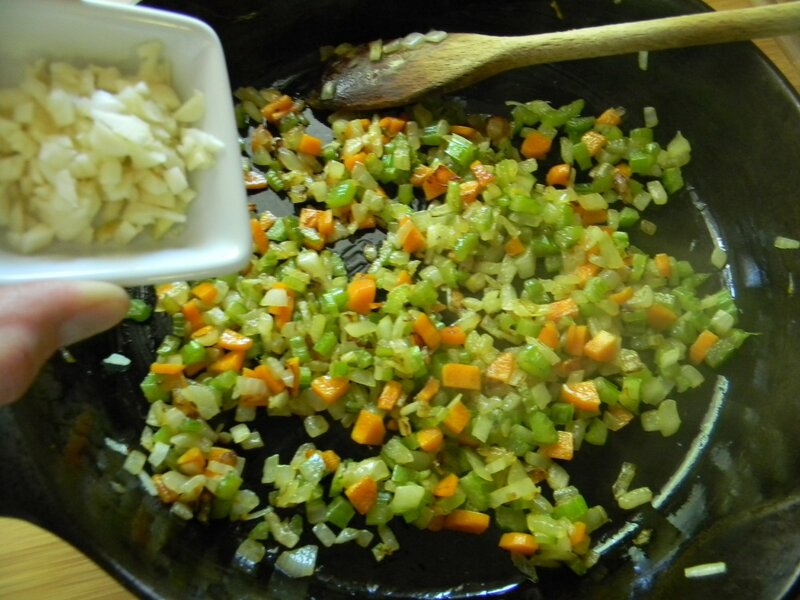 Try chopping the vegetables into 1/2″ pieces and serve on top of crusty grilled italian bread, delish! 1) Whisk all of the vinaigrette ingredients together in a small bowl. Refrigerate immediatley unless you’ll be using right away. 1) In a small bowl, add the mushrooms and a tablespoon of the vinaigrette. 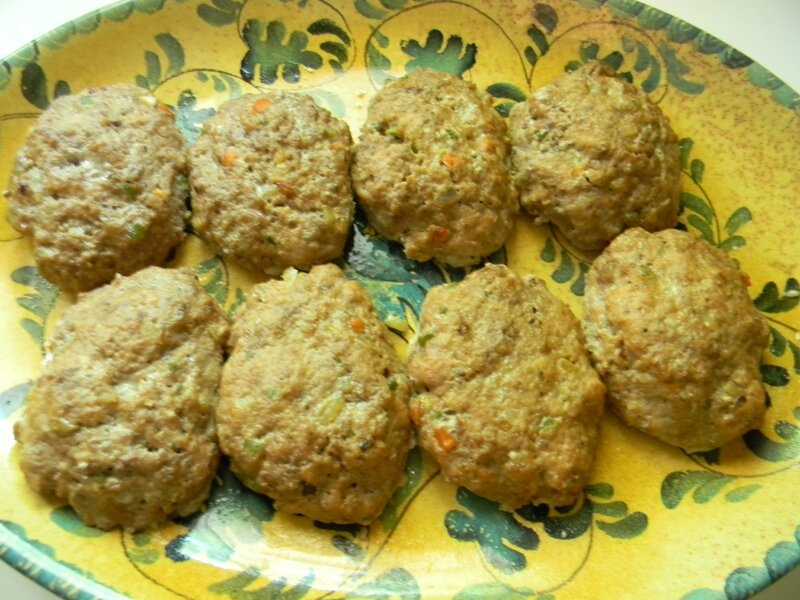 Toss to coat and allow to marinate for 10-15 minutes, continue to toss to coat. Skewer and place on a platter. 2) For the onion, drizzle a little olive oil on each slice and season with salt and pepper. Drizzle the rest of the vegetables with olive oil, season with salt and pepper. Toss to coat. 3) Grill over medium-high heat. The vegetables will vary in cooking time. The onions will take the longest, followed by the peppers and the mushrooms. The squash will cook relatively quick. The vegetables should all have nice grill marks. Remove from the grill and slice the squash into bit size pieces on the diagonal. Do the same for the peppers. Slice the onion slices and the mushrooms into quarters. 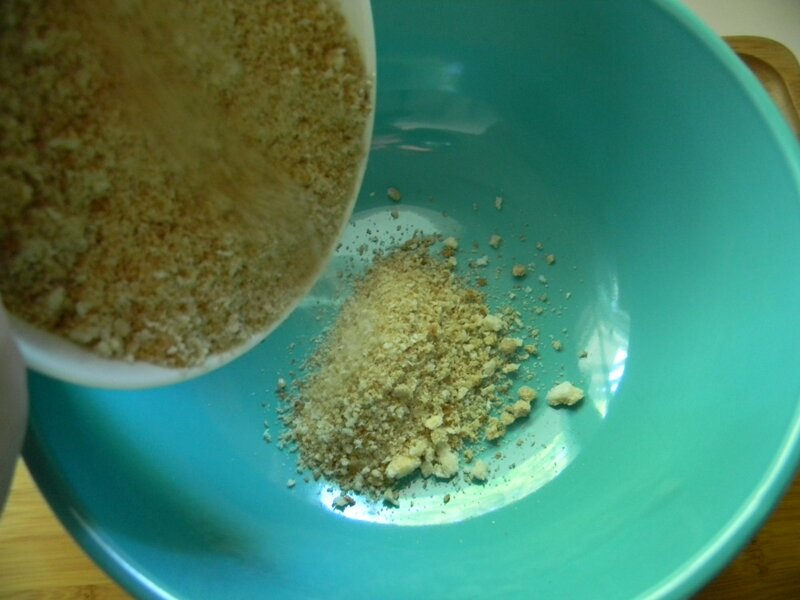 Toss into a medium size mixing bowl. Drizzle the vinaigrette over the vegetables and gently toss to coat. Serve or refrigerate immediately. 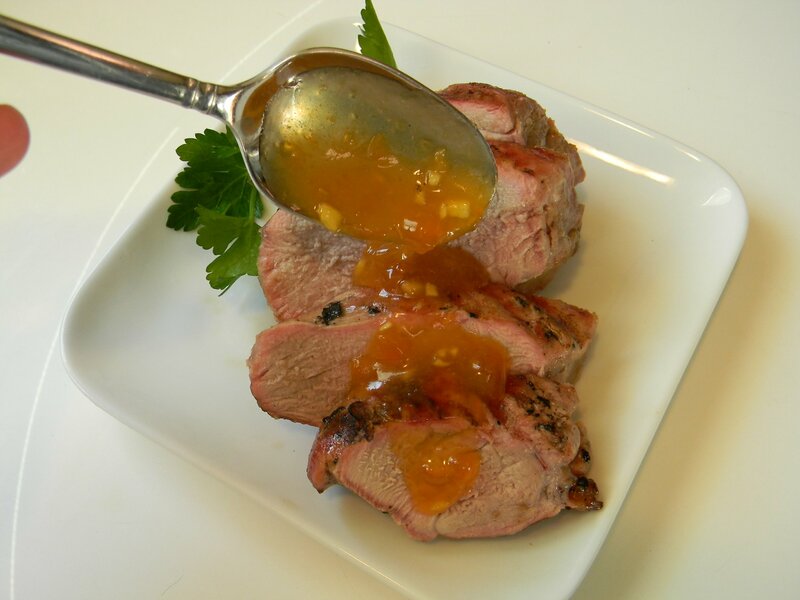 Grilled Pork Tenderloin with Apricot Ginger Glaze…..
Make this simple dish any night of the week. 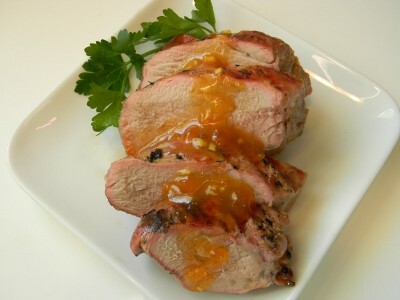 Pork tenderloin usually comes 2 per package. They weigh between 1 and 1 1/2 lbs. per tenderloin. You’ll want to trim off any excess fat and sinew (fibrous connective tissue). 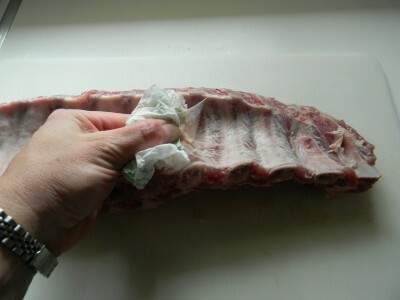 Using a sharp knife, run closely under the tissue to remove. Coat the tenderloins with 1 tablespoon of olive oil and season with salt and pepper. Cook on the grill on medium-high heat for about 25 minutes. Top with the apricot ginger sauce for an additional 5-8 minutes of cooking. Keep a close watch as the sugar in the jam can easily burn. Make the simple sauce. 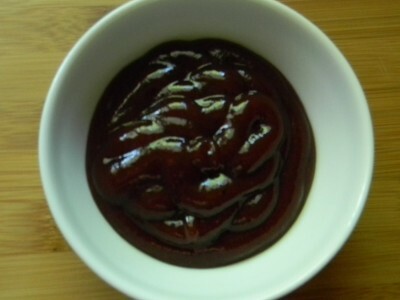 1 cup apricot preserves, 1/4 cup rice vinegar, 2 tablespoons minced ginger root, 1 tablespoon toasted sesame oil, 1 clove crushed garlic, and 1/8 teaspoon red pepper flakes. 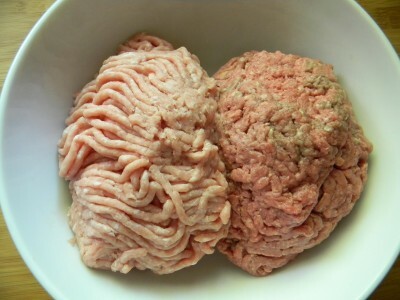 Mix well and divide in half. You will use half while cooking and half when serving. Preheat the grill. 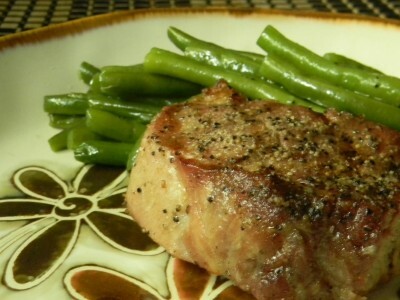 Cook the tenderloins on medium-high for about 25 minutes. Reduce the heat on the grill to medium-low. Generously baste the tenderloins with the glaze. Be sure to watch carefully as the sugars in the glaze can easily burn. Cook another 5-8 minutes. 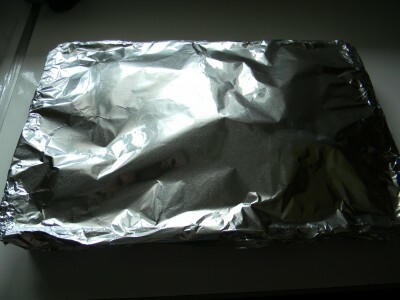 Allow to rest lightly covered with foil for 15 minutes before slicing. 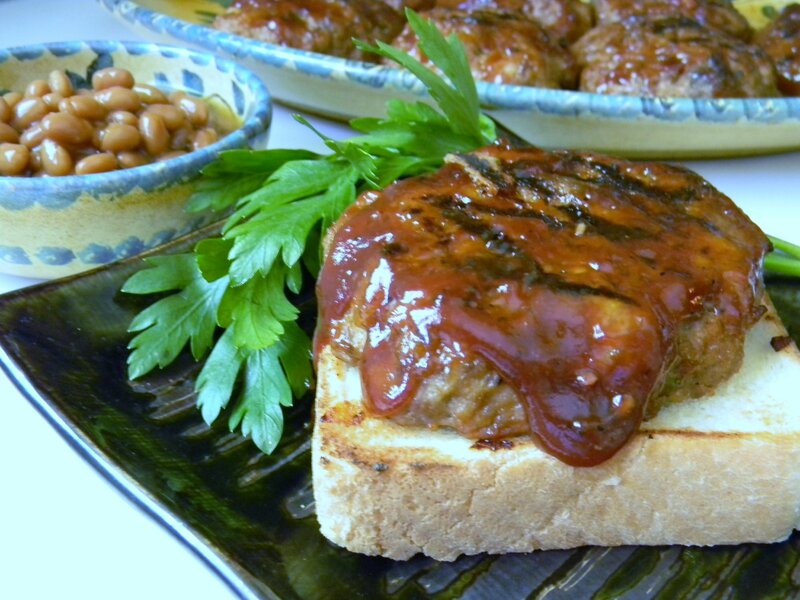 Thinly slice on a diagonal and top with extra apricot/ginger sauce. Serve with steamed rice and stir fry sugar snap peas. Enjoy! 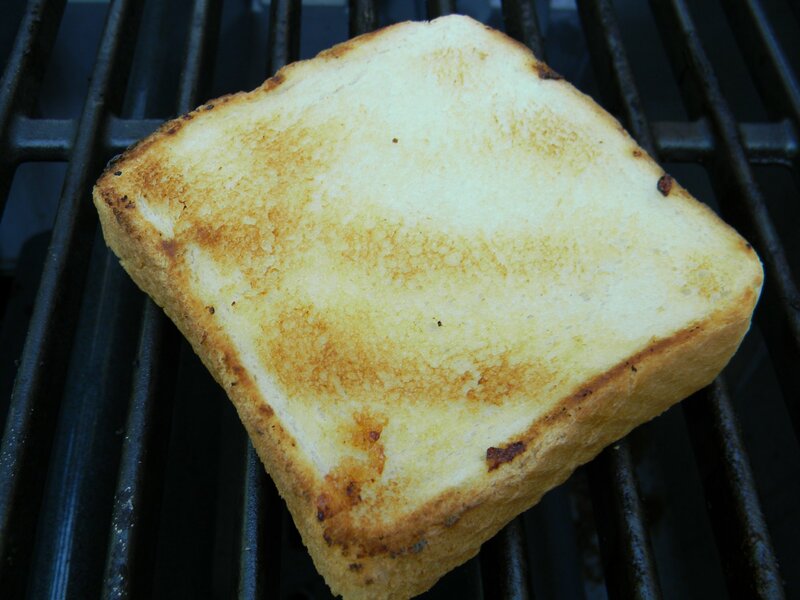 1) Preheat the grill. Trim the tenderloins and coat with olive oil. Season with salt and pepper. 2) In a small bowl, add the preserves through the red pepper flakes, mix well. Divide in half. You will use half to glaze the tenderloin on the grill and half for serving. 3) Once the tenderloins have been cooking for about 25 minutes and have good color, reduce the heat to medium low and generously baste with the sauce. Watch carefully as the sugars in the glaze can easily burn. Cook for another 5-8 minutes, continue to baste. Serve with extra sauce. Serves 4. 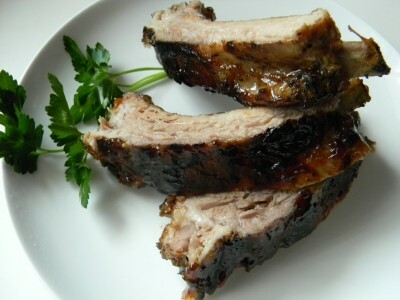 This recipe uses very few ingredients and a very simple cooking technique called braising. Slow roast the simply seasoned ribs in the oven with low heat for a couple of hours and finish on the grill for 10-15 minutes. Feeding a crowd? 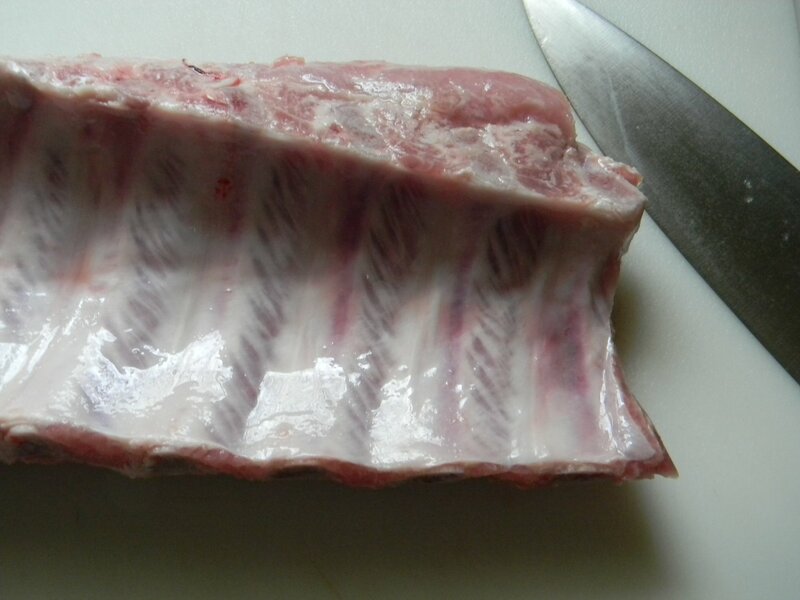 Cook the ribs ahead and refrigerate (you’ll want to use within a few days). 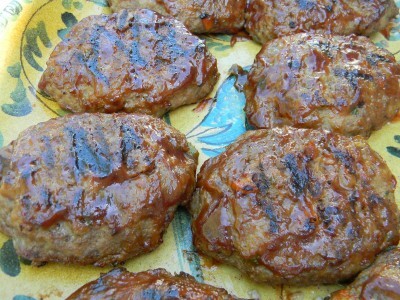 Grill for 10-15 minutes and add BBQ sauce and serve. 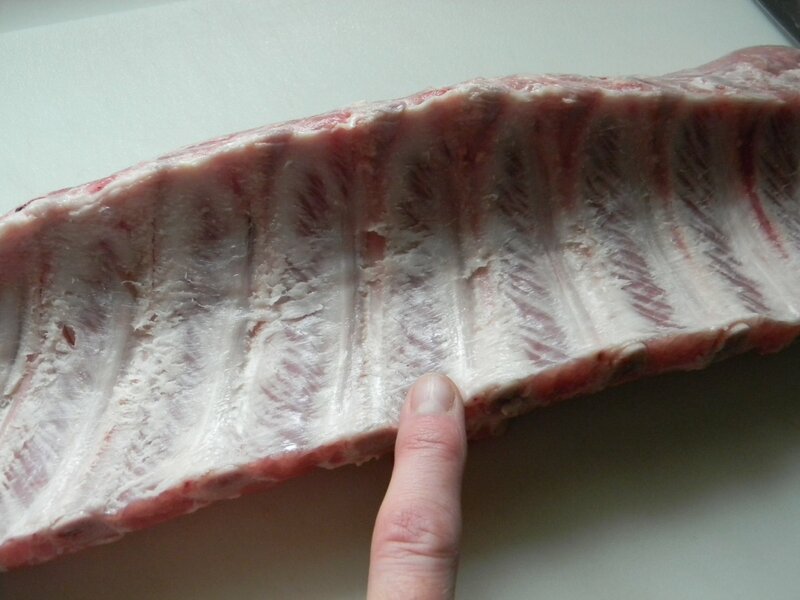 There is a skin on the underside of the ribs, you’ll want to remove it. Using your fingers, grip the skin and pull away from the ribs. If it’s too difficult to grab ahold of the skin with your fingers, use paper towel. This will help to grip the skin. 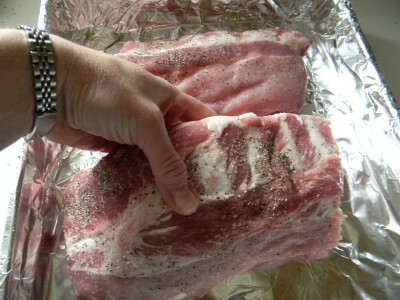 Once the skin is removed, halve the slabs to make them more manageable when cooking. Choose a meaty spot between two bones and slice with a sharp knife. Preheat the oven to 275′. Foil line a deep pan that will hold the ribs without too much crowding. Now we’re ready to season. I season simply with salt and pepper. 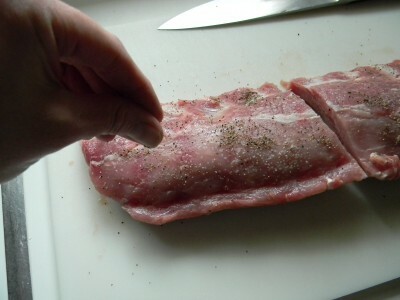 I think salt and pepper bring out the natural flavor in the ribs and of course, you get tons of flavor from BBQ sauce. Cover the pan tightly with foil. Roast for 2 1/2 hours. They’re done. They don’t look very appetizing at this point but believe me, they’re tender and ready for the grill. 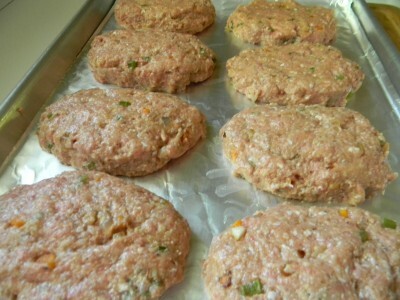 I find that they are more manageable when you allow them to cool a bit before grilling. Preheat the grill to medium high. 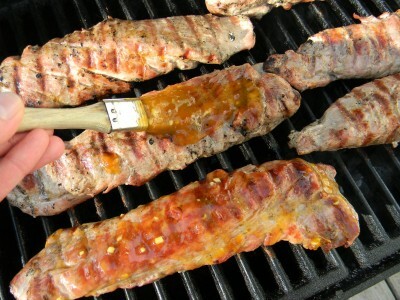 Place ribs on the grill. Grill until they’re heated through. Add your favorite BBQ sauce at the very end. I LOVE Sweet Baby Ray’s, it’s sweet, thick, and a bit spicy, so good. 1) Preheat the oven to 275′. Foil line your pan with heavy duty aluminum foil. 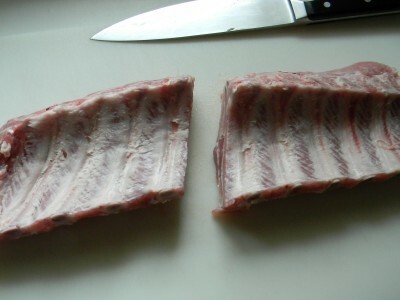 2) Remove the skin from the back side of the ribs and halve the slab. Season generously with salt and pepper or your favorite seasoning or rub. 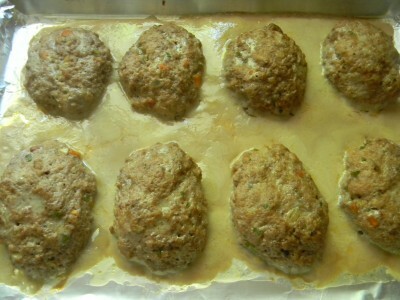 Place into prepared pan. 3) Cover the pan tightly with foil. Place in 275′ oven for 2 1/2 hours. No need to peek. 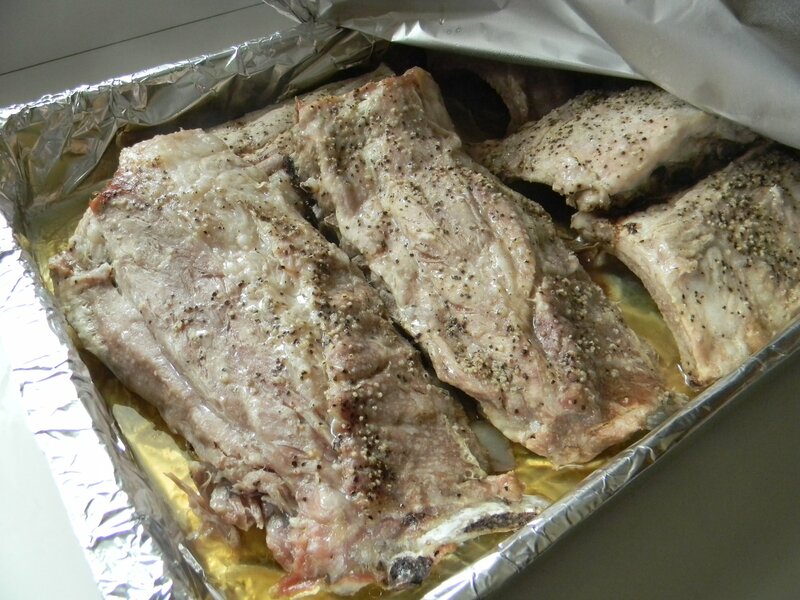 4) Remove from oven and cool or refrigerate to grill later. Preheat grill to medium-high. Place ribs on the grill for about 15 minutes. Liberally add BBQ sauce to the ribs and watch carefully as to not burn the BBQ sauce. Serve immediately.